Since Blank Slate Patterns’ (affiliate link) fall pattern line is coming out this week I thought I should finally write this post about a mod a made to one of the summer patterns. Back here, I showed you the basic Baja Hoody (affiliate link). With just three simple changes, I modified the pattern for a more girly feel. 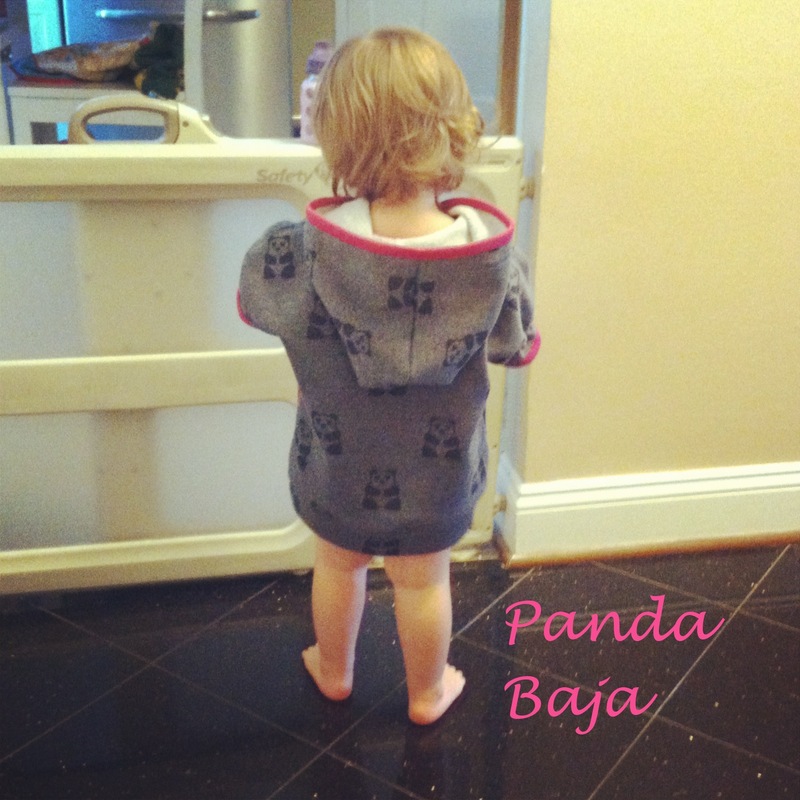 I found this amazing sweatshirt fabric with panda bears on it from Girl Charlee (not an affiliate, but I love their knit fabrics). It is so soft on the inside and nice and thick for warmth. I’ve washed it a few times and it isn’t pilling or shedding yet which is a good sign that it’ll hold up well. And of course I knew Bean would flip over the pandas. They have hearts for eyes! So cute, hehe. My first thought was a shortsleeved sweatshirt that could take us in to fall here in MD. While I was making the test version of her Baja Hoody, I got the idea for a few changes that would turn it into the exact sweatshirt I was picturing. 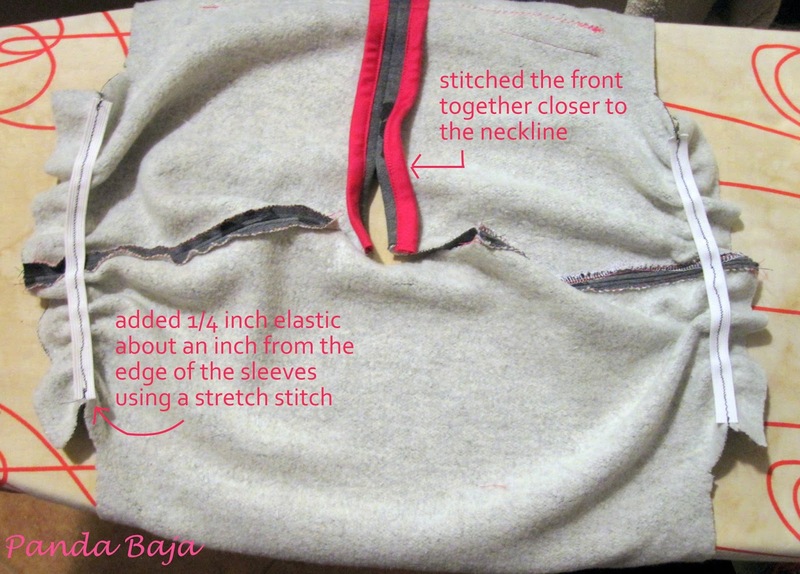 I cut out all the pieces from the pattern the same way I did for the Hoody. The first change I made was to sew the front seam together about an inch and a half higher. Since this is a stretchy knit fabric I knew there would still be room for Bean’s head to fit through (the original pattern assumes no stretch) and I didn’t want the opening to be quite so deep as the days get colder this fall (even though that seems ages away). The second change was made after sewing the front and back pieces together. I sewed a small length of 1/4 inch elastic to the sleeves so they would gather and puff a bit. This is my favorite change. And finally the last change I made was to make a band at the bottom of the sweatshirt to add some length. I love the style and it was a great addition to make this now-beach-cover-up work as Bean grows a bit over the next few months. As seen on Instagram, Bean wouldn’t take the sweatshirt off when I tried it on her for fit. She loves it. While we were on vacation in MA last week it was so cold she actually got to wear it for a while which was one of the only good things about the weather, hehe. I like the smaller neck opening. This version looks really comfy! 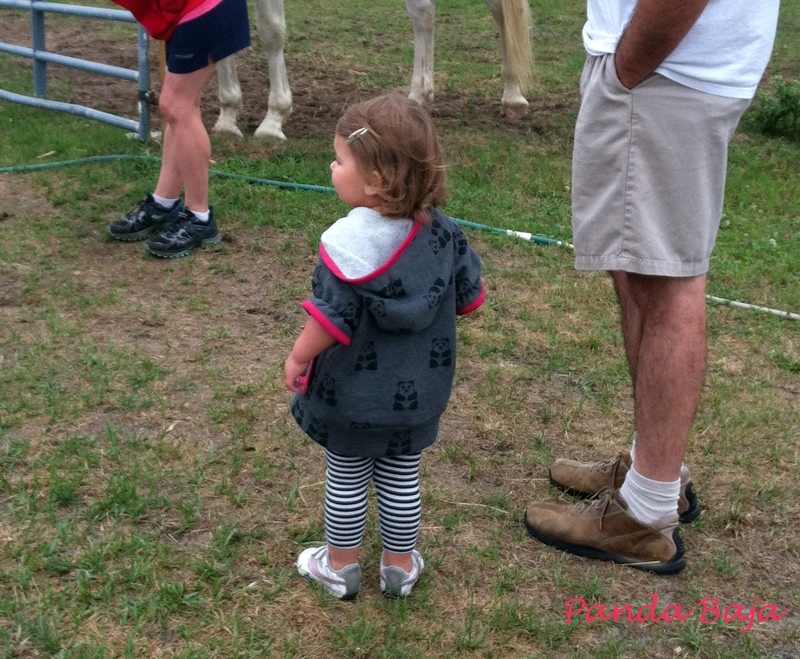 I'm glad to read more feedback, I know everyone raves about Girl Charlee, but I'm a little on the fence. I've order a few chunks- though only used one of the fabrics so far. It's in real regular rotation and it's fading. Which I was a little surprised by, I'm hoping I have better luck with the other two! So cute! 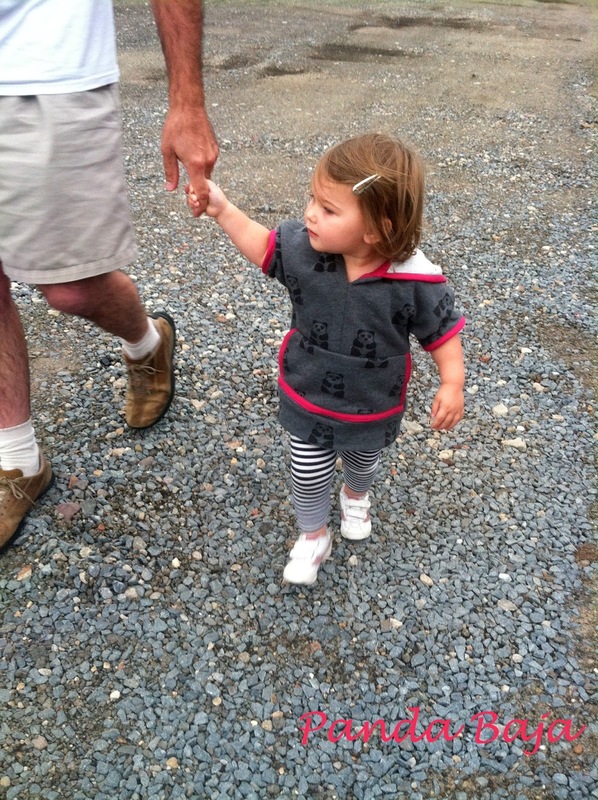 I plan on making a hoodie for my daughter soon. I like the panda fabric. So cute. Good to know that the Girl Charlie Sweatshirt Knit is nice stuff, I have been tempted but wasn't sure how it would wash. If I had a panda sweatshirt as sweet as this one I don't think I would take it off either.